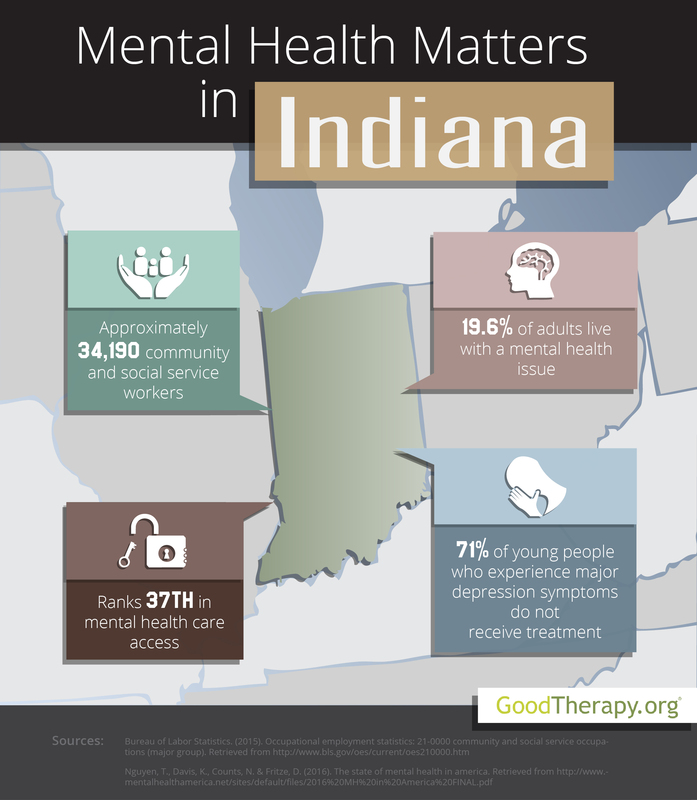 Find a therapist in Indiana with GoodTherapy.org. According to the U.S. Census Bureau, Indiana was home to 6.6 million people in 2015. Of this population, 24% of residents were minors, and 14.3% were 65 or older. The Bureau of Labor Statistics reports that among the adult population, 34,190 residents were employed as depression treatment therapists, healthcare workers at residential treatment centers, employees at drug and alcohol rehab centers, parole officers, community social workers, religious workers, or marriage and family therapists in Indiana. Workers in these and similar service professions earned an average of $41,360 annually. After being evaluated in the 2016 State of Mental Health in America survey, Indiana was ranked 44th—when compared to the rest of the U.S. and District of Columbia—for statewide prevalence of mental health concerns and mental health treatment. This low ranking likely indicates a higher rate of mental health conditions than the average and a lower rate of access to mental health care. Authors of the Mental Health America (MHA) survey contend that Indiana’s overall ranking may correlate with higher rates of child abuse and high rates of obesity in the state. In more specific mental health care categories, Indiana was 44th in adult ranking, 28th in youth ranking, 36th in prevalence of adverse mental health conditions, and 37th in access to professional care. Among the adult population in Indiana, more than 19% of residents experience adverse mental health conditions, 9% display dependence on alcohol or drugs, and 4% have suicidal thoughts. Approximately 62% of those with mental health issues did not receive treatment, while more than 20% of adults with mental health issues are uninsured. Therapists in Indiana have expressed concern about the prevalence and treatment of depression symptoms among younger residents. According to the 2016 MHA survey, Indiana is ranked 31st for adolescents with at least one past year episode of major depression; 40th for adolescents with multiple severe episodes of major depression; 45th for adolescents with symptoms of depression who did not receive depression treatment; and 32nd for adolescents with severe depression symptoms who received some consistent depression treatment. The American Psychological Association (APA) believes feelings of depression are highly treatable; residents are urged to find a therapist in Indiana who may be able to assist their loved ones with chronic low mood. Symptoms of depression may include prolonged feelings of extreme sadness, hopelessness, and helplessness that can interfere with an individual’s everyday functioning. Depression is often addressed using talk therapy, appropriate medications, or a combination of these treatment methods.